This month’s Genre has been chosen by me. In honor of the month when Marty McFly came to visit us here in 2015, I have decided that we will be reviewing our favorite movies featuring time travel. Brief Synopsis – After receiving a strange message from an old woman, a young playwrite tries to find a way to travel back in time in order to meet the love of his life. My Take on it – I was initially intrigued by the premise of this movie but I must say that after watching it, I felt that I was left with many more questions than answers. I just couldn’t ‘buy’ the time travel method implemented here because it was too strange. 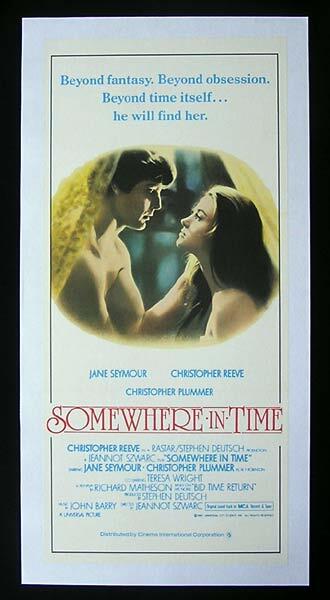 Christopher Reeve and Jane Seymour are both very good here, but I had trouble believing their romance because I felt no chemistry between them whatsoever. Bottom Line – Didn’t work so well for me. The time travel method seemed a bit odd and the whole premise elicits more questions than answers. Reeve and Seymour are both good here but their romance didn’t feel real enough to me.